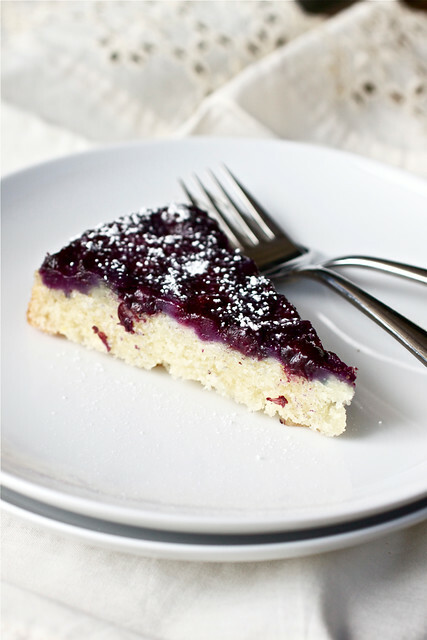 This blueberry buttermilk upside-down cake is a stunner of a summer cake and couldn’t be easier to make either! This is the cake of family secrets. It’s the cake that will make all of the old bitties at the church fair nudge each other out of the way with oversized handbags in order to buy the sole one remaining from the cakes and pies table. It’s the cake I can picture being baked up in a tiny southern Georgia kitchen when the thermometer is crossing 90 degrees at 8am so that it’s ready for tea at 4pm. Maybe it’s the buttermilk that induces these visions…the buttermilk that tends to be that secret ingredient that no one can put their finger on. But needless to say, I’ve found the perfect white cake that I’ve been searching for. It’s a tender – thanks to the cake flour and buttermilk – and delightful cake that, when made into a layer cake, as it should have been with the original recipe, would be a complete show-stopper. Beth of The Powdered Plum chose the original recipe (a 3-layer with Jack Daniels’ buttercream cake) for Project Pastry Queen but I changed it substantially recipe because I honestly couldn’t bear the thought of having to resist a buttercream-encased layer cake sitting on my counter for the rest of the week. Triple this recipe for a 9-inch round triple layer cake. Fill with the buttercream of your choice. Recommended buttercreams: chocolate, chocolate cream cheese, vanilla Swiss meringue, dulce de leche, or whipped vanilla from this cannoli cake. Place one of the oven racks to the center position of the oven. Preheat the oven to 350° F. Spray the bottom and sides of a 9-inch round cake pan with cooking or baking spray, place a circle of parchment paper over the bottom of the pan (on the spray), then lightly spray the parchment paper with more cooking or baking spray. In a medium bowl, whisk the flour, baking soda, salt, and baking powder together; set aside. Stir the lemon zest into the buttermilk, set aside. In the bowl of a stand mixer fitted with a paddle attachment, beat the butter and sugar on medium speed about 2 minutes, until light and fluffy. Scrape down the sides of the bowl. Add the egg white and vanilla and beat on medium speed for about 1 minute. Add about one-third of the flour mixture to the batter and beat on medium speed until just incorporated. Add about half of the buttermilk and beat on medium speed until just incorporated. Continue adding dry and wet ingredients alternately, scraping the bowl down and beating until incorporated after each addition. End with the dry ingredients; the batter should be thick and glossy. 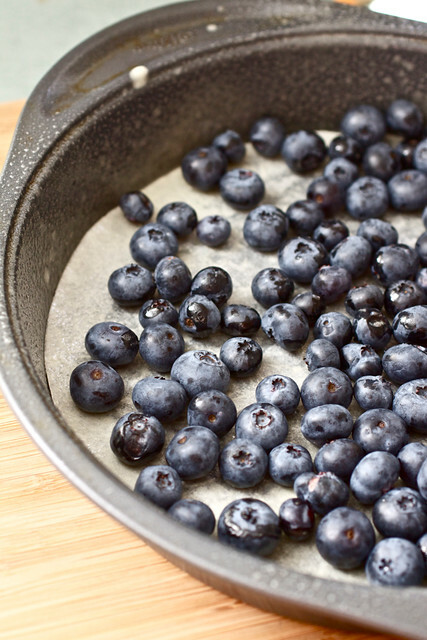 Spread the blueberries out in the bottom of the pan. 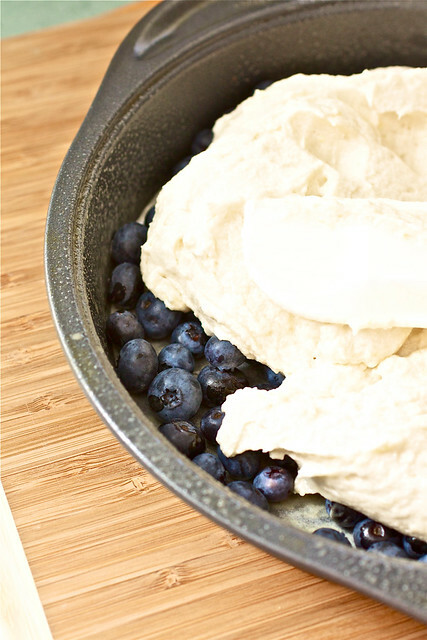 Spoon the batter evenly over the blueberries and using an offset spatula, smooth the batter out to the sides of the pan. Bake for 25 to 30 minutes, until a toothpick inserted into the middle of the cake comes out mostly clean with just a few crumbs on the toothpick and the top is flat and lightly browned. Set the cake pan on a wire rack to cool for 10-15 minutes. Invert the cake onto the rack and allow to cool completely before transferring it to a cake plate, dusting with powdered sugar, and serving. OMG Tara, this looks incredible. So so pretty! And I agree, the white cake was really outstanding! This looks absolutely wonderful; I cannot wait to try this! I love, love, love it! Perfect! I’ve been seeing some amazing blueberries at the farmer’s market but didn’t know what to do with them. Now I have my answer! Excellent adaptation! This looks so yummy to me! I love buttermilk in baked goods, I bet this cake really does send people into a frenzy! 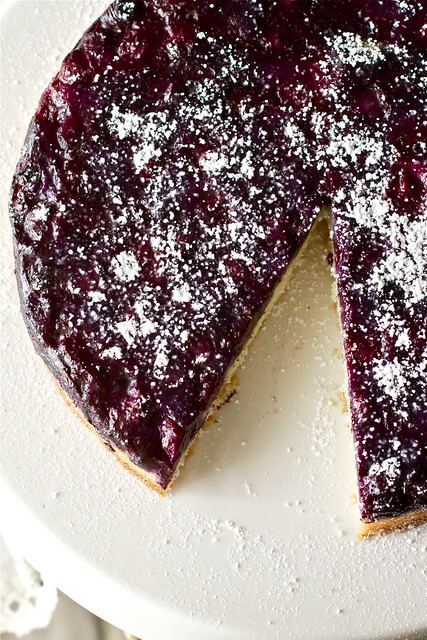 i’m hunting for ideas to use up my blueberries, this is a great idea! and thanks for sharing the buttermilk secret :-). I can’t wait to get home and give this a try! Thanks for sharing! The original recipe uses 1/2 cup buttermilk — tough to divide into thirds. How much did you use? Do you think 3 Tbs would be close? I think I will make this for a brunch I’m hosting this weekend! Gorgeous cake and fantastic idea! The original recipe calls for 1 1/2 cups of buttermilk, not 1/2 cup – I just let Beth @ Powdered Plum know about the typo. In this case, obviously, you would use just 1/2 cup. Great question! Thanks!! Too bad I just saw this today and made the cake over the weekend! It was still really good though. But I will say, I thought the cake layer was a tad too thin. Maybe that’s because the buttermilk was off – but I put down in my notes for next time to try it using 1 and 1/2 times the Powdered Plum cake recipe. Thoughts? That cake looks amazing, I must get that recipe! Great variation on the traditional upside down cake AND the traditional white cake. I love this! Oh, what a delightful cake! I love how you created the yummy blueberry topping…mmmmm. This is a fabulous cake! The layer of blueberries sounds delicious and looks so pretty! I love an upside down cake I am not entirely sure but I just do. This looks wonderful and the addition of buttermilk always makes a cake fantastic. Is there anyway you can repost YOUR version of the cake with any added notations on your website…. I would love that!! I really want to make your cake!! I am heading to Maine…. THANKS!!! Thanks!!! :-)) Yours looks so wonderful!!! Thanks for the effort of doing that!!! I made this tonight for dessert and it was so good (and super easy)! Because I’m trying to watch my weight, I substituted a Stevia/sugar blend for the sugar but it still tasted yummy (and no on in my family could tell). I like that the cake layer is not too thick – I thought it was just right. I will definitely be making this gem again! I made this and was so unhappy with the results, the cake was flavorless and spongy. Worst of all I wasted my blueberries! 🙁 I followed this to a T…bummer, I was looking forward to this being as delish as everyone said it was . Chach: I’m sorry to hear this. We really loved everything about this cake! Do you have any idea what could have gone wrong? You know, I dont always have liquid buttermilk on hand so I used buttermilk powder which has always worked out great when Ive used it in other recipes…I’m wondering if maybe that had something ot do with it? I did follow all directions though.